My nine-year-old daughter commented the other day that it was confusing to turn off the living room lights because you couldn’t just push it down to turn it off, sometimes you had to push it up and sometimes you had to push it down. As an aside, the typical toggle switch doesn’t offend me. Paddle switches with screwless wallplates are nice, but not necessary; I just want to fix the usability issue. One solution would be a single push-button switch. 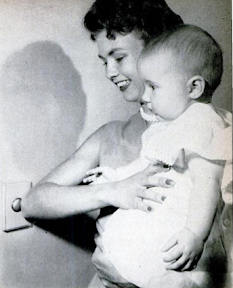 In an example of what was old is now again, the 1950’s house I lived in as a child in the 1980’s had Honeywell Tap-Lite switches. (At least it did at first, my first exposure to electrical wiring was when my dad had to replace some 30 year old switches that failed.) Recently, Legrand has introduced push-button switches in its Adorne line. I think I might use these in my house. An even better solution would be a switch that you could simply always push down to turn off. 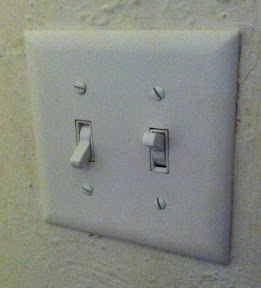 It could spring back to the center position, so if the switch at other end of the room was used it wouldn’t end up in the wrong position. But I haven’t seen such a switch for normal residential use. The amazing thing is that all these switches are backward compatible. The living room switches above were a replacement for the original 1920’s two-button switches that failed after over 90 years of service! I like the character of those old switches (and there are reproductions available now), although the three-way version did have the same usability issue. 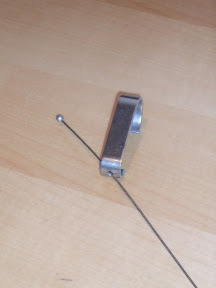 But, I was able to swap out the 90 year old part with little more than a screwdriver. I think about this when I see USB charging ports that you can hard wire into your house now–will any new hardware and software of today be as compatible at the dawn of the 22nd century? The say a picture is worth a thousand words so here’s a few thousand of things I’ve been improving at home. One thing I like about our old house is the picture rail incorporated into the crown molding. 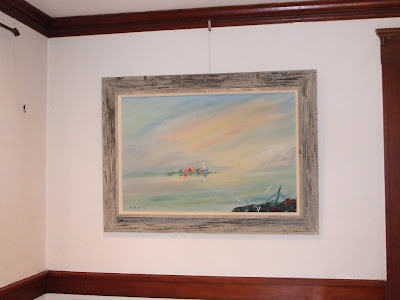 Picture rails are an anachronism; they’re a way to hang pictures without making a hole in the wall, but with today’s materials it’s easy to patch a small hole–even in old textured plaster walls–that only places like art galleries and office buildings that constantly rotate art need a hanging system. I wanted to use the picture rails but it took a while to find hardware I liked. 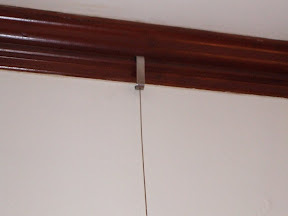 Molding hooks are easy to find at a local hardware store or in vintage designs through reproduction catalogs, but they require a wire to be looped around a hook, creating more visual noise on the wall than I wanted. 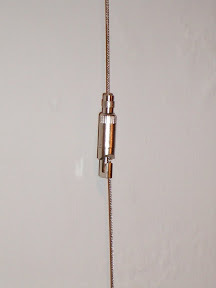 The fun part is the cable grippers with an integrated hook, that attach to the art instead of a regular picture hanger and can be moved up and down without tools. You cannot get anything like this at a local store. I bought the whole system from a company called Hang Ups. They have a website but are clearly more of a business-to-business operation; it’s not like ordering from Pottery Barn. Over the past week or so Iâ€™ve been spending my evenings and weekends prepping and painting our home office, a task that involved a lot of prep work, a new high-tech paint, and being mistaken for a pro. The office is a unique little room, separated from the living room by French doors with lots of windows. A lot of houses in the area built around the same time have a â€œsun roomâ€ that projects out of the house, with windows on three sides, and maybe not heated well, but this room is a little different because itâ€™s a regular room, not projecting out. Whatever the original purpose was, we use it a lot like the first-floor home offices present in a lot of better homes built within the last ten years, for paying bills, holding papers and computers, and we are even hoping it can be a place for grandmothers to stay once the baby comes. Itâ€™s one of those â€œold is newâ€ things we really like about this house. Another thing we like about the house is that, except in the bathroom and kitchen, it has its original plaster walls and ceilings. On the first floor the walls are textured. But, like any active octogenarian, it has some wrinkles, or more precisely cracks, and this room also had some water stains on the ceiling from what must have been a leak in the roof. Actually, the walls are in very good shape for their age, while the house has settled such the nothing is level the old plaster coming loose from the lathe is really cosmetic and worth saving both for its character and because replacing it with drywall would just be unneccessary. So, this is not really just a painting project but a mini-renovation and redecorating project to get the room in better shape, including patching the walls. Patching plaster is something Iâ€™m not very good at, though I get a little better every time. The basic plan is to widen cracks and remove the crumbly bits (down the lath in a couple areas) and fill with setting-type joint compound (â€œsettingâ€ in that it doesnâ€™t dry per se but hardens from within after mixed with water, like concrete or, well, plaster), then sand smooth or until I canâ€™t stand the dust even with a dust mask. Actually, next time I may try web going over the partly-cured plaster with a wet sponge, a technique I gave up on once in my last house before I knew to use the setting-type compound. I will say that Iâ€™ve gotten the mixing of the compound down, about 4 parts powder to one part water, which is a prerequisite skill as well. Fortunately the texture on the walls is rather random so it hides the patch work, rather than highlight it as some textured finished would, and this room was a good one to get practice on. The leak in the roof scares me but it seems to be old, we havenâ€™t see any evidence of an active leak and from what we know the house got a new roof a few years ago. The best home improvement advice I read once was to first try the simplest and least expensive thing that will work, which in this case meant painting over the stains with an oil-based primer. Then paint the ceiling. I love the look of a fresh, white, velvety-soft-looking ceiling. 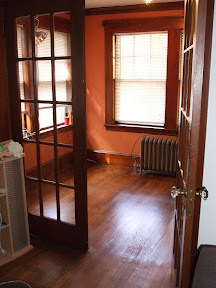 Itâ€™s a small room and we wanted a deep color that would â€œpopâ€ the room off of the living room, making it feel like a separate, cozy area and work well with the reddish gumwood molding and French door. We chose a pumpkin-like orange called â€œbuttered yamâ€ (second choice was â€œpumpkin pieâ€) and the color really feels like comfort food; it reminds me of being in my grandparentsâ€™ den (orange naugahyde sofabed and manufactured wood paneling on the walls, circa 1970). Our last experience with dramatic color was not good: red paint that didnâ€™t cover and dripped off the walls like ketchup (Cheryl said like blood), and people though weâ€™d attempted some decorative painting technique. This time I was prepared to use a special primer and as many coats as it takes. 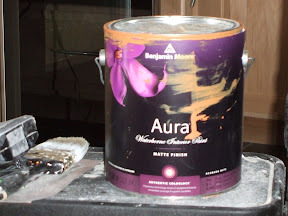 At first Iâ€™d dismissed Benjamin Mooreâ€™s new Aura line of paint as overpriced, but then I did the math: Iâ€™d need a least two $36 gallons (paint plus tinted primer) of regular paint, maybe I could get by with one $54 gallon of Aura for less? It might actually save money. Iâ€™ve found Benjamin Moore paints better than Home Depotâ€™s Behr paints that I used to buy, and the fact that in this house thereâ€™s a store five minutes away with better service makes it the obvious choice in terms of getting things done. They paint salesman gave me the advice that, contrary to usual good painting practice, I should let the paint dry after cutting in the edges when using this paint. This worked well, and really shows the best part of the Aura paint which is the synergy between fewer coats and a fast drying time, allowing recoat in as little as an hour. We did need two coats but no more, resulting in four â€œbatchesâ€ of painting and drying (cut in, dry, roll, dry, cut in second coat, dry, roll second coat) within about six hours. With other paint it would have taken at least ten hours (three coats with four-hour drying times) which means I would have been in painting mode all weekend and less time for the rest of family life; this is the biggest difference, plus I didnâ€™t need that second gallon so I saved money, too. Because of the woodwork, I also did a lot of masking with this job, using that plastic film with masking tape along one edge. In rooms where Iâ€™ve painted moldings, too, Iâ€™ve sometimes tried to â€œfreehandâ€ the edges, because all the masking takes more time than the painting and isnâ€™t always perfect anyways, but in this case I resigned myself to spending more time prepping than painting and the results turned out pretty well. Finally, I put a couple coats of Holloway House floor polish, as-seen-on-TV, on the floor. Itâ€™s not a substitute for refinishing, but at least it doesnâ€™t just look neglected. My father always made a big deal about turning off certain appliances when we werenâ€™t using them; now I’m the dad and it’s my job. Recently Iâ€™ve seen a lot of articles (even a new book on the topic) about how doing little things–like unplugging cell phone chargers (I’ve seen this in a few places recently) and turning off or unplugging other appliances that draw small amounts of current (I like the term â€œfleaâ€ power)–can save a lot of energy. I just came across an article in the Wall Street Journal (an news outlet which, like PBS, I find worth paying for to get a perspective that differs from the rest of the media herd) that confirms what Iâ€™d thought all along: devices that donâ€™t do much generally donâ€™t use a lot of energy. This is important because efforts to encourage people to do things that are easy, like unplugging a cell phone charger or reusing a plastic bag, are likely to consume our psychic energy and make us feel good without doing things that, from a scientific basis, could really make a difference. Itâ€™s the unbreakable laws of thermodynamics from basic physics: things that create a lot of light, heat, and/or movement consume a lot of energy. A light bulb that could burn your hand while illuminating the room is a lot bigger problem than some device with a little LED that gets just a little warmer than room temperature. Unfortunately, itâ€™s not as easy to do the big stuff: either itâ€™s expensive and hard to know if itâ€™s worthwhile, or it would require unacceptable changes in life. Right now Iâ€™m trying to find someone to insulate my attic, which Iâ€™ve decided, even at a cost of more than a thousand dollars, is the biggest difference I can make; even getting someone to come give me an estimate is a hassle. But keeping my house uncomfortably cold, or not using the car, are not realistic options. Newer houses are better insulated than mine will ever be, but tend to be biggerâ€”according the WSJ article above, they have more than 45% more space to light and heat than those built a generation ago. Iâ€™m not going to lose sleep worrying if Iâ€™ve done enough little things to save the planet; Iâ€™m going to lose sleep over the big ones. It’s official: our house is a construction site. We have our very own “orange square” (building permit); and Steve brought in a big dumpster and demolished the kitchen. Nothing new built yet, although tools and lumber have started to appear. The temporary kitchen is not so bad. It’s like being on vacation. What do we need a new kitchen for anyway? The harder part is never quite knowing when things are going to change.